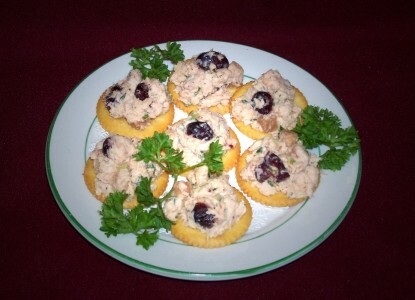 This appetizer is a great way to use any leftover turkey and enjoy a classic holiday flavor combination. Try spreading the terrine on bite size cornmeal biscuits, or easiest of all, use crackers like Garlic Butter Ritz. Use food processor to chop turkey until coarsely chopped (do not overprocess). Mix parsley, mayonnaise, butter, mustard, wine, celery, apple, cranberries, chives, sage, lemon zest, pepper and salt until blended. Add turkey and mix well. If mixture is too dry, add a little more wine. Place in serving container or mold, cover with plastic wrap, and chill 8 – 24 hours. Let stand at room temperature 30 minutes before serving. Serve with buttery crackers or cornmeal mini-biscuits. Terrine may be stored in airtight container up to 3 days.